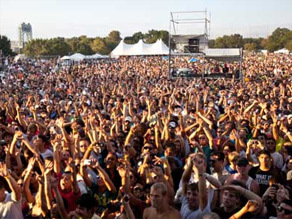 26,000 electronic music fans gathered for the two-day Electric Zoo Festival in New York on Labor Day weekend. Dance music has long been relegated to dark nightclubs of the underground music scene in the United States. But over Labor Day weekend a new electronic music festival brought sunlight and fresh air to the growing genre. Electric Zoo Festival, a first of its kind event in the U.S., set up shop at Randall’s Island Park in New York City for a two-day, open-air dance music party. Over sixty artists took to four stages to perform in front of a crowd of thousands of eager fans, who were more than happy to see their preferred music genre given a new spotlight. New York has always played home to emerging artists and cutting-edge trends in music. But with hundreds of the city’s club and music venues having shut down in the past decade, dance fans have been left with few places to turn. Made Event co-founders Mike Bindra and Laura De Palma, no strangers to electronic dance music events, hit a seeming homerun with Electric Zoo. “Electric Zoo was an incredible first festival for us. The natural beauty of Randall’s Island Park, the wide selection of musical choices, and the excitement of fellow beat junkies, all culminated in a successful inaugural festival. We look forward to bringing it for many years to come,” they said in a press release. Armin van Buuren, Saturday’s headliner, topped a lineup of the electronic music industry’s biggest and best names: Kaskade, Deadmau5, Benny Benassi, Tiga, Roger Sanchez, Steve Aoki – just to name a few. If mainstream audiences aren’t familiar with some of those artists, they’re not to blame. “It was in these places, the gay clubs, that dance music really started,” says Kaskade, born Ryan Raddon, a San Francisco DJ who became a star thanks to the underground music scene. Techno, house, trance, electro – are just some of the names given to the multitude of genres and styles of music gaining in popularity. As the genres grow, so do the crowds – from hundreds to thousands. Electric Zoo organizers announced a combined attendance of 26,000 people at the two-day event. (CNN) — Former Democratic Rep. James Traficant, who only days ago was released from a federal prison after serving seven years on a bribery and racketeering conviction, told CNN Monday he may make a bid to return to Congress. Former Democratic Rep. James Traficant told CNN Monday he may make a bid to return to Congress. "I'm not sure at this point," Traficant told CNN's John Roberts on American Morning when asked if he wanted to seek a return to the body that, in a near unanimous vote, voted to expel him more than seven years ago. "Both parties would not want to see me in Washington, believe me… I was very controversial down there," he said. "I'm the guy that changed the burden of proof in a civil tax case and had a bill moving forward that would finally, with the fair justice act, allow these people in the Justice Department to be charged and investigated and prosecuted for crimes." Traficant also brushed aside recent criticisms from the mayor of Youngstown, Ohio — his hometown — that the former congressman is no longer representative of Ohio voters. 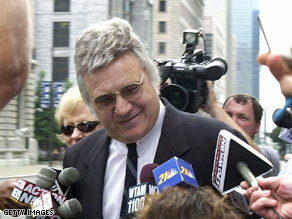 "I think I did a few things around Youngstown that helped Youngstown and improved Youngstown," said Traficant. "So I'm going to have a lot of…opposition if I do run, but quite frankly, I don't give a damn. "You know, beam me up, I'm ready if I decide to run," Traficant also said, using his trademark closing like from Star Trek. A profanity-laced outburst by tennis superstar Serena Williams could cost her a lot more than originally thought. Williams has already been hit with a $10,000 fine for swearing and waving her racquet at a line judge. She was also fined an additional $500 for racquet abuse when she threw her racquet and broke it earlier in the match. 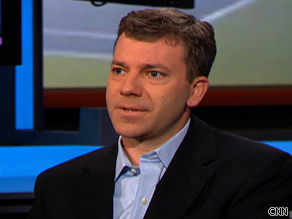 Jon Wertheim of Sports Illustrated calls Serena Williams' outburst unprecedented. The incident with the line judge occurred after she was called on a foot fault in the semifinals of this weekend’s U.S. Open. If officials decide Williams committed a major offense under the Grand Slam rules, she could lose all of her prize money and maybe even suspended from a future Grand Slam event. Jon Wertheim has been covering the U.S. Open for Sports Illustrated where he's the senior tennis writer. He joined John Roberts on CNN’s “American Morning” Monday. Below is an edited transcript of the interview. John Roberts: Have you ever seen anything like this? Jon Wertheim: Not like that. And certainly not from Serena. We've seen players lose it with officials but to get that close and threaten like that. Also, at that stage – a Grand Slam semifinal. That was unprecedented as far as I’ve seen. Roberts: There is no clear angle that I have seen on the foot fault. Apparently that line judge, though, she's very good. She's very confident in the calls that she makes. Serena had been called for a foot fault a couple – three games earlier on the other side of the court by a different line judge. If it was an infraction, it was a minor one. She wasn’t a foot into the court or anything like that. Maybe she touched the line. Looking at it, John McEnroe said you don't call something like that at that point in the game. It was 15-30 with Serena serving, and she touched the line. Should that even have been called? Wertheim: I mean, you know, in a perfect world it never happens, but I don't think you can waive off infractions. You get on slippery terrain pretty quickly when you make calls or don't make calls based on where you are in the match. I mean, you're either over the line or not. Unfortunately, you wish one way or the other there was conclusive video. It was a pretty shaky call, but that in no way excuses what followed. It has been a year since Lehman Brothers collapsed and we learned about the big risks Wall Street was taking with our money. Today we kick off a series of special reports called "Banks Gone Bust." We're asking if Wall Street can ever be trusted with our money again. CNN's Allan Chernoff investigates whether we're any safer today.